Proper inflation is key to your tires' safe performance and even contributes to your vehicle's fuel economy. According to information shared by Schrader International from NHTSA and the U.S. Department of Energy, nearly 200,000 accidents are caused by tire-related issues each year, and 60 highway fatalities and 33,000 injuries are caused by under-inflated tires each year. If that's not bad enough, the Department of Energy estimates that 3 to 5 million gallons of gas are wasted each day -- more than a billion gallons of fuel each year -- because of under-inflated tires. In fact, motorists can improve gas mileage by approximately 3.3% by keeping tires inflated to the proper pressure. To alert drivers when their tire pressure is low, monitoring systems have been required by law on all new vehicles sold in the United States since 2007, though some vehicles were equipped with them as early as 2000. This system constantly monitors your car’s tire pressure and alerts you if it falls below a preset limit, to make you immediately aware of a drop in pressure below safe limits. Unfortunately, according to survey results from Schrader, 42 percent of drivers still can’t identify the Tire Pressure Monitoring System (TPMS) vehicle dashboard icon, and 1 in 10 surveyed admit to having intentionally ignored a TPMS warning and continued to drive. When your TPMS dashboard light illuminates, your tires are sending you a very important message: One or more of your tires is significantly underinflated and you or an auto service technician needs to check your tire pressure as soon as possible. The TPMS warning symbol will illuminate when one or more of the tires is 25 percent under-inflated, at which point the vehicle is impaired, affecting maneuverability, handling, and braking distance. There are two types of tire pressure monitoring systems installed in vehicles today: direct and indirect. Direct TPMS systems use pressure sensors inside each tire to send a signal about that tire's air pressure information to a receiver that can then illuminate a light on the vehicle's instrument cluster to alert the driver. The system can identify under-inflation in any of the car's four tires with a typical trigger point of 25% below the recommended cold psi rating. Depending on your vehicle, this type of system can give a general "low-pressure" alert, while other systems can actually identify the pressure in each individual tire to tell the driver which tire needs attention. Indirect TPMS systems do not use physical pressure sensors but rather measure the apparent air pressure by monitoring individual wheel rotational speeds. According to Chilton, an underinflated tire has a slightly smaller diameter than a correctly inflated tire and therefore rotates at higher revolutions per second to cover the same distance as a correctly inflated tire. The system functions in combination with anti-lock braking and electronic stability control system wheel speed sensors to identify when tires are spinning differently enough from each other to indicate under-inflation. Indirect TPMS systems must typically be recalibrated after adding air to a low tire, after changing or servicing a tire, or after rotating the tires on a vehicle. This is usually done by pushing a reset button on the dashboard or through the onboard computer, and then driving the vehicle for a determined amount of time so the system can "learn" the correct rotational speed. If this is performed when any tire is in an underinflated condition, the system will not report correctly. According to TireReview.com, one of the weaknesses of older indirect TPMS systems is that they may not signal a warning if all the tires are underinflated by a similar amount. For instance: If the recommended pressure is 32 psi, but all the tires are at 24 psi (down 25%), the system won’t know there’s a problem because all the tires will be rotating at the same speed when the vehicle is being driven. If you see the TPMS light, you don’t have to panic, but you should make an immediate effort to check the pressure in all four tires manually using a tire pressure gauge. Remember, you can’t tell if your tires are at their correct pressure just by looking at them: it is virtually impossible to tell a tire is under-inflated visually until it is nearly 50 percent deflated. If you don’t have a tire pressure gauge, or just don’t want to get your hands dirty, then simply make a visit to your nearby tire retailer: Many tire shops will check your tires and inflate them to their correct pressure as a courtesy, especially if it means they might earn your future business when it is time to replace those tires. Tires that are properly inflated wear evenly and last longer before needing repair or replacement. 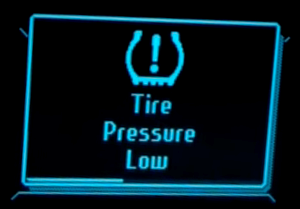 In fact, pressure just 5 psi below placard pressure could lessen a tire's tread life by as much as 25%. Under ordinary driving, a typical tire can lose 1 to 2 psi a month, and cold weather can also reduce pressure by 1 psi per each 10 degree fahrenheit change. If not checked and adjusted regularly, your tires may be heading toward replacement faster than necessary. Don't just rely on your TPMS to alert you to low tire pressure: Check your tire pressures monthly with a quality air pressure gauge and keep them filled to the vehicle’s manufacturer specifications listed in your manual or inside your vehicle's doorjamb.